﻿Restrictions in East Texas counties are leading to better antler production. ﻿﻿﻿“That’s five mature bucks we’ve seen so far,” my brother whispers to me as we hunt through the wet understory, watching a nice eight-point drift through the woods. Since Thanksgiving Day, rain has slowly fallen, soaking and softening the otherwise dry and crunchy oak and ash leaves that carpet the creek bottom. Just two days past the holiday, the Fannin County whitetail rut is in full swing. Conditions for a mobile and active hunt are perfect: the dappling rain and wet vegetation hide our sound and our smell while the frenzy of the rut has deer paying attention to everything else but us. Everywhere we look we see nice, mature bucks. That’s a far cry from November 1989 when I killed my first deer on this property. Back then we were lucky to see any deer at all during an entire season. Steadily, however, the deer numbers increased, countywide and statewide. Each season we saw more and more deer, but the quality remained substandard compared to other places in Texas. Now, however, with the county deer population reaching a critical mass, it seems as though the antler quality and age structure have found a balancing point. The thanks for this hunting delight is owed to antler restrictions. In some areas of Texas, particularly east of Interstate 35, deer hunting is relegated mainly to small land parcels. Unlike the thousands of contiguous acres under single ownership on ranches in South and West Texas, land in the eastern half of the state is more fragmented. The more the land is divided, the harder it is to develop a cohesive management and hunting strategy. It is difficult to manipulate whitetail age structure on a county or area-wide level. Strickland’s report was one that echoed throughout the East Texas hardwoods. While hunters down south and out west were experiencing a deer revival (and the ensuing antler quality was reaffirming Texas’ place as a free-ranging, world-class whitetail destination), hunters in the eastern half of the state weren’t faring as well. Fragmented property lines and a small deer population that allowed for only a single buck harvest per hunter in most counties made mitigating the age and antler quality problem tricky. “Since our place is relatively small, we share the same deer with landowners around us,” says Fannin County whitetail enthusiast Garrett Amlin, referring to a deer’s propensity for movement within a square-mile home range. “We were being careful and trying to target a specific age class of deer, but the minute they went across the fence, our management strategy went with them. There were never any guarantees that any of our neighbors shared our management philosophy,” Amlin explains. Prior to antler restrictions, Amlin says, many hunters in the area would shoot any buck just to harvest a deer. The indiscriminate harvest put undue pressure on bucks of all age classes. As a result, young bucks were never allowed to grow and reach their full genetic potential for body size or antler growth. “You’d see big deer being taken from all over the state, and we’d wonder why we didn’t have that here,” Amlin says. “We had the habitat, we had the deer, but we just didn’t have the quality you’d expect to see. Particularly when one county over, world-class bucks are harvested every single year.” One county over is Grayson County, whose archery-only season limits the overall harvest, thus allowing deer to reach their full genetic potential and a higher average age class. The impetus for countywide antler restrictions began — at least in an official, state-sanctioned capacity — in the late 1990s, when hunters and landowners in six counties east of Austin began talking to Texas Parks and Wildlife Department officials about implementing regulations to protect immature bucks. 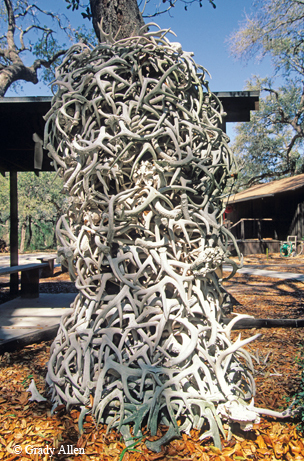 After years of studying the problem, TPWD biologists began experimental antler restrictions in those six counties in 2002. • At least one unbranched antler. • An inside spread measurement between main beams of 13 inches or greater. • Six points or more on one antler. ﻿The primary goals of the experimental antler restriction were to improve the age structure of the buck herd, increase hunter opportunity and encourage landowners and hunters to become more actively involved in better habitat management. To provide guidance, the department suggested that a buck whose antlers have a spread that grows beyond both ear tips meets the minimum width requirement — a guideline that still is in play today. By 2006, the experiment had proved successful. According to TPWD research, 52 percent of bucks harvested in the 1990s in counties under the initial, experimental guidelines were 11/2 years old. 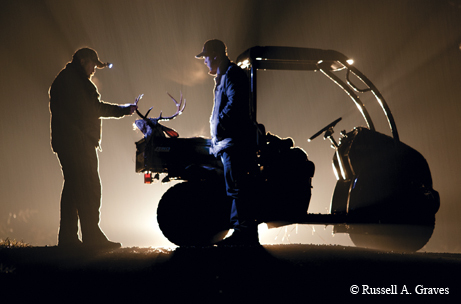 By 2008, the percentage of harvested bucks in that age class had dropped to 21 percent. Conversely, in the 1990s, only 4 percent of the bucks were 41/2 years or older. 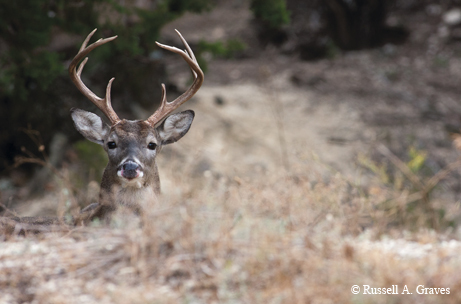 By 2008, 41 percent of the deer harvested fell into that advanced age class. Following the success of the initial counties, these same regulations began to creep into other counties in the region. By the end of the decade during which antler restrictions were implemented, TPWD had introduced the restrictions in even more counties. By the 2014 season, that number grew to include nearly half of the counties where whitetails are hunted in Texas, 117 in all. Although most of the counties are in eastern Texas, a growing number of Central and Northwest Texas counties have been added to the list. In the Pineywoods, where harvest numbers and antler quality haven’t been comparable to other parts of the state, Calkins says the implementation of antler restrictions has been positive. Since the early adoption of antler restrictions, the guidelines have been mostly unmodified, though the six-points-or-more allotment has been dropped. Most counties will allow you to harvest two bucks: one with an unbranched antler and another with a spread of 13 inches or greater. In effect, the antler restrictions have created a slot limit like those common in fishing regulations. Calkins says that when antler restrictions were imposed, a few people opposed them, but not many. In Fannin County, Amlin is passionate about the success of antler restrictions, though he does concede some possible downsides. Furthermore, he thinks that some deer possibly could be wasted because of the restriction. He can see where a hunter might accidentally shoot a borderline legal buck but leave it there rather than risk a ticket by tagging and removing the deer. Strickland, of Wood County, says that because of the effort to avoid shooting a sub-legal buck brought on by antler restrictions, he has become a better hunter. Even in counties that do not fall under a harvest restriction, Strickland says he watches deer longer and studies their movements more and has learned more about them in the process. 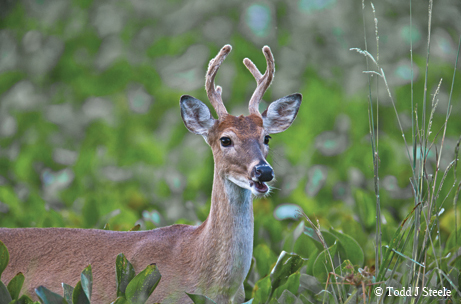 While the age structure of the deer in the affected counties continues to improve in terms of wildlife management and hunter satisfaction, the drought in Texas threatens to dampen, but not disrupt, the progress made. “The most noticeable impact of drought on deer populations is decreased fawn recruitment, which in turn results in a reduction in the population or slower population growth over the short term,” says TPWD white-tailed deer program leader Alan Cain. This loss of fawn production means that whole age classes of deer may be affected in an area. 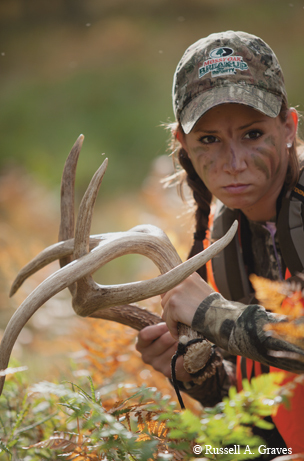 Therefore, hunters aren’t likely to have as many opportunities on deer within that specific age class. Cain says that there’s little to worry about and that the numbers will rebound once normal rainfall patterns return. Despite the lack of rainfall, Amlin says he’s really pleased at what the antler restrictions have done for the deer herds in his county.